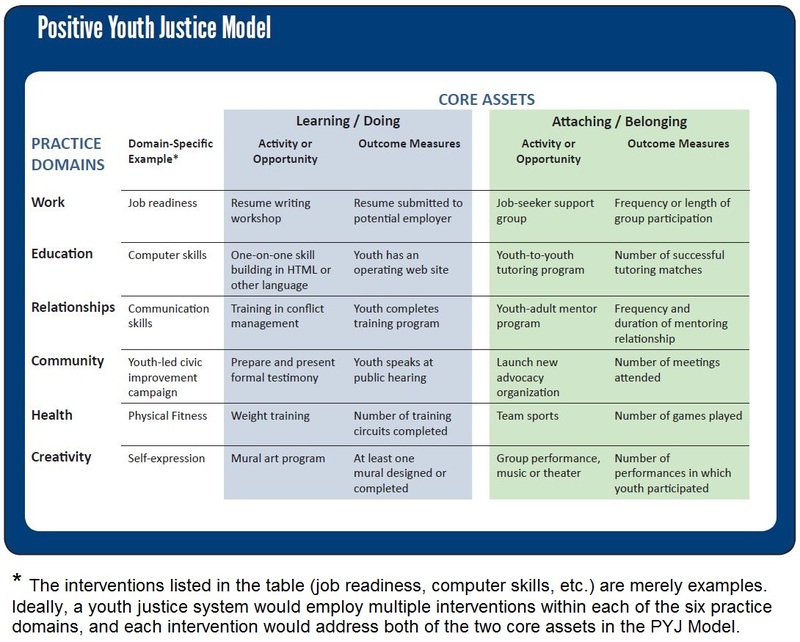 In 2010, the Coalition for Juvenile Justice in Washington, DC released a report to launch the Positive Youth Justice (PYJ) Model. The report was written by Jeffrey A. Butts, Gordon Bazemore, and Aundra Saa Meroe. The Positive Youth Justice Model is designed to blend the scientific understanding of adolescent development with the practical concepts of positive youth development in order to address the implementation challenges facing programs for young offenders. The model offers an alternative to the traditional, risk-focused, catch-punish-and-release approach to youth justice. It also differs from the deficit focused, rehabilitation approach that concentrates on treating mental health problems, substance abuse, and trauma. All justice-involved youth, even those who require some of these specialized treatments, need basic supports and opportunities if they are to build resilience, avoid future justice contact, and learn to lead positive and productive adult lives. Where should justice authorities turn to conceptualize and implement such interventions? The Positive Youth Justice Model is designed to facilitate this task by encouraging justice systems and service providers to maximize youth access to positive, pro-social experiences. Funding for the Positive Youth Justice report was provided by the Community Foundation for the National Capital Region.